Healthcare in the United States is in a state of rapid transition. The Affordable Care Act has changed the way many Americans pay for health care and medical and health IT technologies are opening up new possibilities for treatment and access. Telehealth software has an important role to play in this transformation, so it is worth some degree of study. The term “health information technology” (health IT) is a broad concept that includes an array of technologies to store, share, and analyze health information. Telehealth (also called telemedicine) is a subset of health IT that encompasses the use of technology to deliver health care, health information or health education at a distance. State and federal agencies often differ on how they define telehealth. The federal Health Resources and Services Administration (HRSA) defines telehealth as, “The use of electronic information and telecommunications technologies to support long-distance clinical health care, patient and professional health-related education, public health and health administration.” These technologies include both hardware and software. The US population is increasing, but there is a shortage of healthcare professionals being educated, trained and licensed. This means that we must find ways to use each of these valuable resources in the most efficient way possible. In addition there is an increase in the incidence of chronic disease, including diabetes, congestive heart failure and obstructive pulmonary disease. Add to that the need to care for the growing number of elderly and the need to serve rural areas that lack specialists and health facilities and you have a situation that calls out for the solutions that telehealth software provides. Telehealth software can be broken down into three types of applications: real-time audio/video communication, store-and-forward and patient monitoring. Real-time communication occurs when the patient is at one site and the provider is at another and they use a webcam and a telephone or computer audio to conduct a clinical visit. In some cases the patient is at a healthcare facility with a provider and they connect to a remote specialist for consultation. In other cases, the patient is at home without a provider on site. Most state laws that require private payers to reimburse for telehealth visits, require use of both audio and video. Store-and-forward is related to the transmission of digital images, as in radiology or dermatology for a diagnosis. This eliminates the need for the provider to meet with the patient in person. It is important to note, however, state laws vary on reimbursement for store-and-forward telehealth. Remote monitoring (also known as self-monitoring or self-testing) uses a selection of devices to monitor health and clinical signs of a patient remotely. It is used most commonly in the management of chronic diseases such as diabetes, asthma and cardiovascular disease. It is an approach that increases patient compliance with testing and minimizes costs. 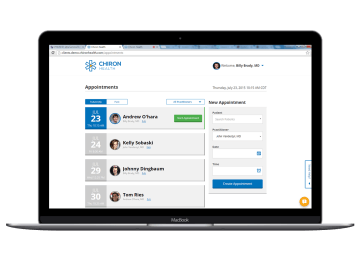 Chiron Health is focused on providing an easy-to-use real time communication telehealth solution that improves patient satisfaction and health outcomes while ensuring that providers are able to get reimbursement and remain compliant. Our solution is ideal for follow up visits and chronic disease management. Insurance policies and state laws vary greatly when it comes to reimbursement for telehealth. That’s why our reimbursement specialists verify the eligibility of every patient and guide you through any payer-specific billing nuances. We have a trained regulatory team, so you don’t have to. We provide you with all required telemedicine legal documentation, including patient consent, so that you maintain compliance. To ensure HIPAA compliance we use a fully encrypted platform and we execute a Business Associate Agreement (BAA) with every client. We offer high touch technical support for both providers and patients. With in-app support, our team is able to catch technical issues before a provider’s time is ever wasted. Telehealth software is a critical innovation and a giant step forward in achieving convenient access to healthcare for all patients and an efficient delivery method for providers. Chiron Health is proud to be a leader in advancing the growth of this powerful approach to patient care. Our experts are available to answer your questions and show you how easy it is to add telehealth to your practice.